Have you booked your flight for the remaining months of 2018? If not, check the new Cebu Pacific promos as low as P699 one-way fare! Yes, you may book or buy ticket as low as P699 for select domestic routes from Cebu. International sale tickets are as low as P1,399. Featured on this Cebu Pacific seat sale are affordable fares from Cebu, Manila, Davao, Cagayan De Oro. Promo fare tickets can be used for trips on September, October, November, December 2018.
Review your travel bucket list now and check if you can find promo flights for your dream destination. Booking for this sale is ongoing until August 4, 2018 for Philippine travel and until August 7 for international flights. Quoted Cebu Pacific promo tickets are good for one-way trip. Inclusions for domestic flights: base fare, Web Admin Fee, taxes/fees, Domestic terminal fee and up to 7 kilos hand carry baggage. As for the international promo fare ticket, quoted fares cover only the base fare and Web Admin Fee. Travel tax and International terminal fee shall be paid at the airport prior to departure except for flights from Manila station wherein the international terminal fee is already included in the ticket. 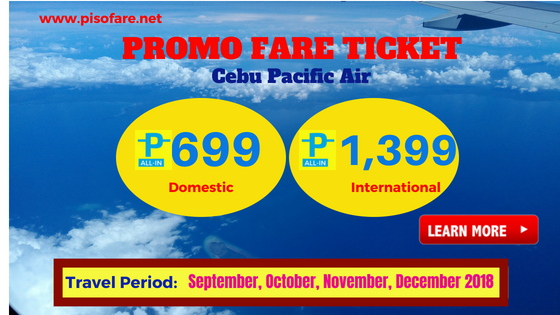 Contact Cebu Pacific hotline numbers: (02) 702 0888 (Manila) or (032) 230 8888 (Cebu) and book ticket with their CSRs. Cebu Pacific sale tickets are non-refundable but can be re-book subject to re-booking charges plus fare difference. Still need more promo fare 2018 to 2019? You may receive promo notifications and travel tips and updates by following us in Facebook: PISO FARE TICKET!